I'v got Vodafone UFB with landline, by using the HG659 router provided by VDF I can connect the phone to the phone port on HG659, how can I set up the phone on ERL, so that I can connect the cordless phone to ERL? Hmm Vodafone UFB is pretty suboptimal since they force the use of their router. How do they force it? surely just mac address? I mean if you need phone service you need to use their router instead of using the ONT with some other providers. So, important to note that vlan offload is still disabled with 1.9.1. I got around to completing my network configuration over the weekend, which meant setting up several vlans. After I noticed my speeds had dropped down to ~120mbit. Was cursing the gods/ubnt/BigPipe when a mate pointed out this thread which reminded me about offloading. Back to normal once that option was enabled. So if you're ever going to use vlans, you'll want to make sure you enable that option at the same time. 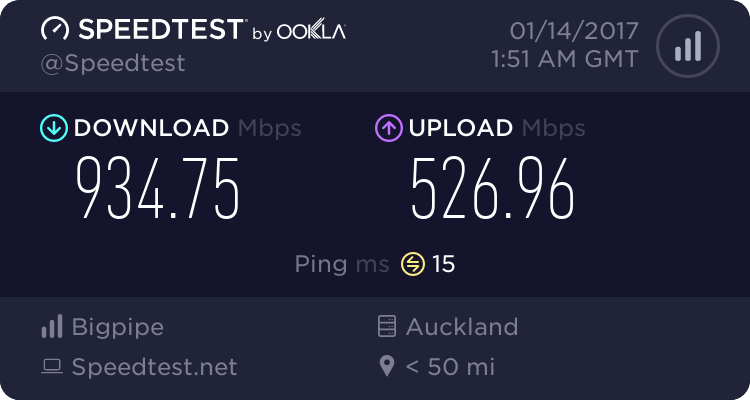 Silly/Noob question; if I run an iperf test to Spark's server from the edgerouter I seem to only ever get ~150mbit, if I run the same test from my laptop I get the speeds I was expecting, is this normal? Another here who has used to this tutorial to set up an ER-Lite on Bigpipe. I have never tried that, but it is in line with my understanding of how the Edgerouters work. If you run iperf from the Edgerouter, the traffic is going to not be able to be handled by the offloading hardware and instead will have to be handled by the CPU. Offloading only works for packets received by the ER on one of its external interfaces, and transmitted again on one of its external interfaces. Offloading is not possible for packets generated on the ER itself or to be received by the ER itself. The CPU can not do packet processing as fast as the hardware can, and depending on your configuration, 150 Mbit/s is a not unlikely speed for what the CPU can do. With minimal configuration, an ERLite 3 is reported to be able to do CPU processed packets at up to somewhere around 300 Mbit/s, if my memory serves me correctly. But the max CPU processed speed drops off fairly quickly with a bit more configuration, and with QoS enabled and lots of config it will likely only do less than 100 Mbit/s. @fe31nz your answer is spot on! It's because you're paying for a 1000/500 product from your ISP. 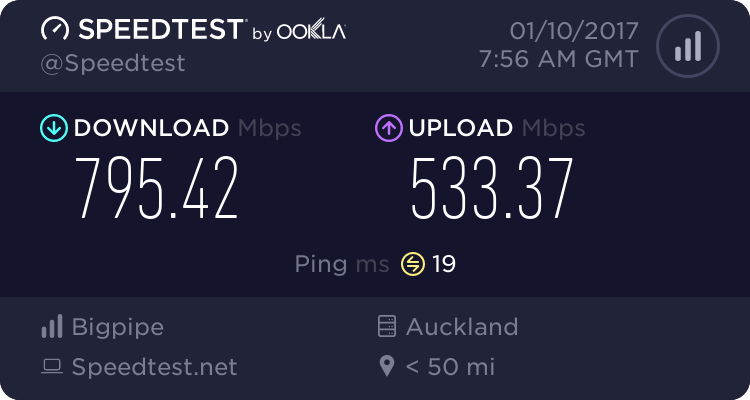 If you want to pay more you can buy a faster connection.